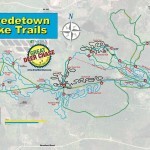 Bike Map – Hand-out maps are available at the trailhead or at Cross Country Sports in Calumet. Signs are posted at trail intersections. Click the thumbnail for a larger, printable map. Ski and Snowshoe Map – Trail maps are posted at intersections. Click the thumbnail for a full-size map suitable for printing.